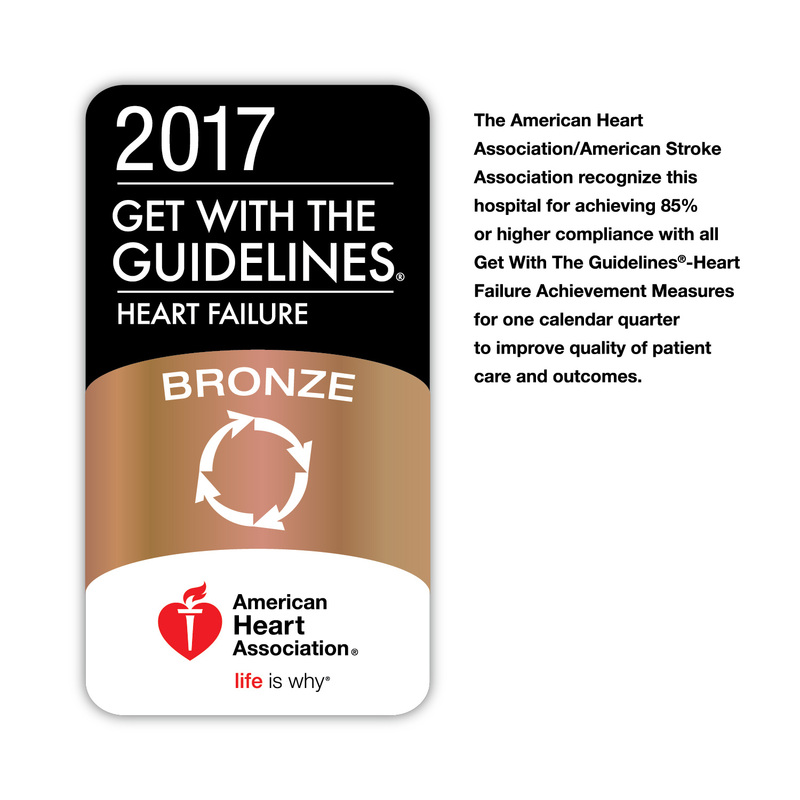 Bryan, TX, February 19, 2018—CHI St. Joseph Health has earned the Get With The Guidelines®-Heart Failure Bronze Quality Achievement Award for implementing specific quality improvement measures outlined by the American Heart Association/American College of Cardiology Foundation’s secondary prevention guidelines for treating patients with heart failure. CHI St. Joseph Health was the first provider to earn this recognition in the Brazos Valley. Get With The Guidelines-Heart Failure is a quality improvement program that helps CHI St. Joseph Health provide care according to the mos t up-to-date, research-based guidelines, with the goal of speeding recovery and reducing hospital readmissions for heart failure patients. Launched in 2005, numerous published studies have demonstrated the Get With The Guidelines-Heart Failure program’s success in achieving patient outcome improvements, including reducing the rate of readmission to the hospital within 30 days of their discharge. CHI St. Joseph Health earned recognition by meeting specific quality achievement measures for diagnosis and treatment of heart failure patients, such as using ACE inhibitors/ARBs (pharmaceutical drugs for treating hypertension), beta blockers, diuretics, anticoagulants and other therapies. Our team also provides education to patients, before they are discharged, on managing their condition and overall health. They work to schedule a follow-up visit and provide other care transition interventions. One way CHI St. Joseph Health met the standards for the recognition was through its Heart Failure and Coumadin Clinic. Opened in 2013, the clinic is the only one of its kind serving the Brazos Valley. This clinic refers patients to follow-up care within one week of discharge from the hospital and provides valuable education to patients and their families on self-care and symptom management. According to the American Heart Association, about 5.7 million adults in the United States suffer from heart failure, with the number expected to rise to 8 million by 2030. Many heart failure patients can lead a full life when their condition is managed with proper medications or devices and healthy lifestyle changes. About Get With The Guidelines: Get With The Guidelines is the American Heart Association/American Stroke Association’s hospital-based quality improvement program that provides hospitals with the latest research-based guidelines. Developed with the goal of saving lives and hastening recovery, Get With The Guidelines has touched the lives of more than 5 million patients since 2001. For more information, visit heart.org. About CHI St. Joseph Health: CHI St. Joseph Health offers the region’s only Chest Pain Center with Primary PCI with Resuscitation accreditation from the American College of Cardiology and the American Heart Association, the highest accreditation offered by these credentialing agencies. CHI SJH has also offered an Advanced Primary Stroke Center since 2007 and is the region’s only provider of endovascular treatment, meaning the stroke team is able to treat patients within a larger window of time following onset of symptoms. The Heart Failure and Coumadin Clinic supports heart failure patients in self-, follow-up and urgent care and provides tools and resources to assist patients in their transition from the hospital to home.